The Grand Circus manages to leave a lasting impression on the player, the game doing justice to the real circuses, the ones that entertain you and impress you with everything you see there. It’s one of the Microgaming designs, so the quality shouldn’t be a surprise, especially since it seems to be one of their more recent slot machines. The theme choice is not that original, but it’s very well implemented, so it’s not a problem. 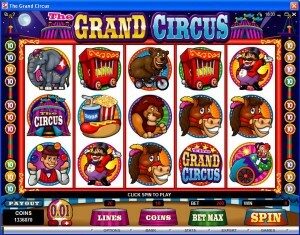 The 5 reels of Grand Circus host a total of 20 win lines. 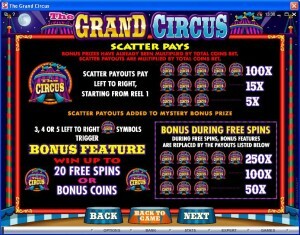 You get only scatter symbols and bonus games which give you free spins or cash prizes. The game’s biggest prizes will reach a value as high as $50,000, but during the base game you only get up to $20,000. The game lacks the usual wild symbols that other slots offer, or multipliers for that matter, but it does have a scatter symbol which can give you access to a bonus game, where you win either cash or free spins. 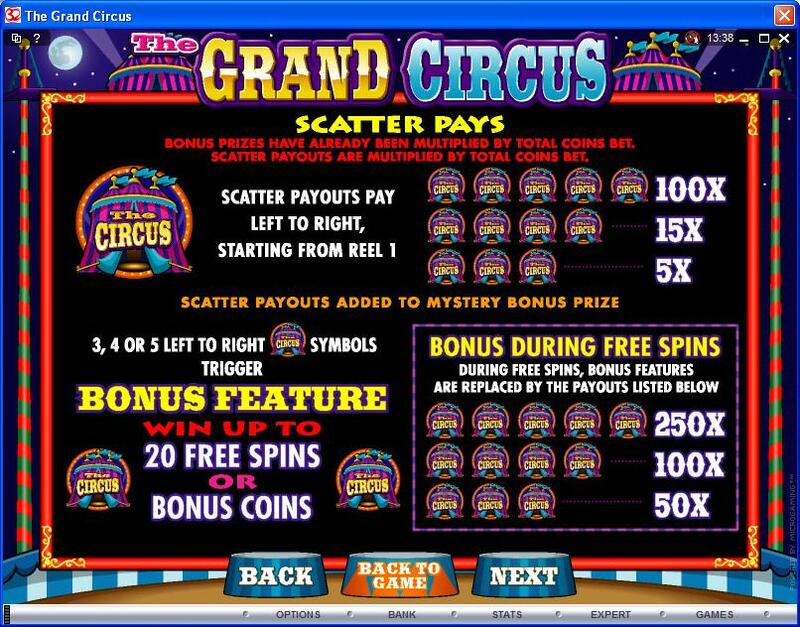 The scatter is the only feature symbol available in The Grand Circus. It shows you an image of the Circus Tent and it is a rather limited type of scatter, where the symbols can be anywhere on the reel, but on reels which go from the leftmost position to the right. 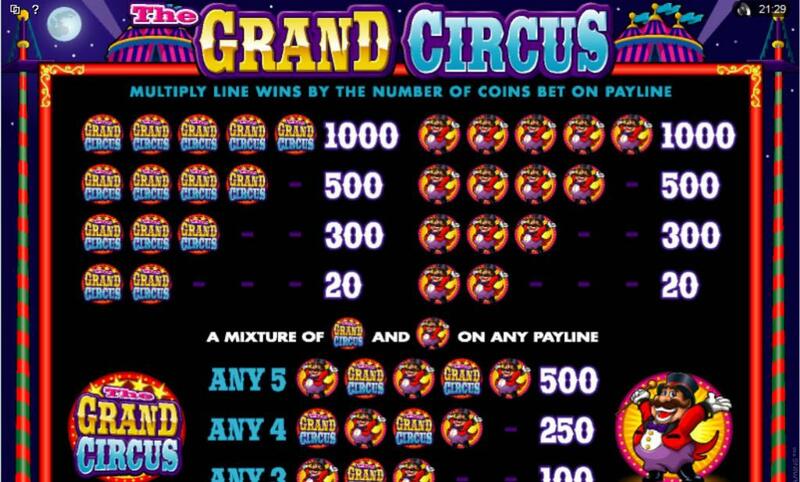 Get three or more scattered Circus Tents to be arranged on the at least the first three reels, and you’re going to find that you get a prize of 5x to 100x the wager, plus access to the bonus game. Besides the payouts offered when enough scatters arrange themselves from left to right, you’re also going to get the bonus game started. 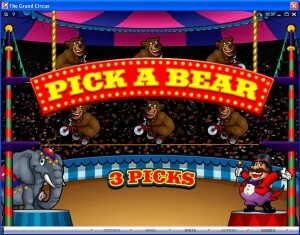 In this bonus game, you are taken to another screen, where bears are shown dancing on a tight rope. You have three choices to make, each one bringing you either free spins or cash prizes. As many as 20 free spins may be won in this feature. If you get free spins, they will start up next, with the scatter symbols increasing their payouts and no longer triggering bonus games. Instead of prizes of up to 100x plus a bonus game, you get up to 250x the bet with enough scatter symbols present. It’s quite easy to keep in mind what the betting system allows you to do in this game. Each coin starts at a minimum value of $0.01 and has a maximum of $1. With up to 10 coins per line, the bet goes up to $10. Since you have 20 lines, the maximum bet is worth $200. Now, the slot’s biggest prizes come from the scatter symbol. If during the base game it brings you up to 100x the bet ($20,000), the free spins offer you up to 250x the bet ($50,000) for the same five symbols. The game’s design is the best argument it has going for it. While the features will probably be a disappointment, the design was excellently handled and it includes all sort of characters and animals that seem to be having fun. There are no playing cards, only cartoon style objects, foods and characters/animals that are part of the circus acts. 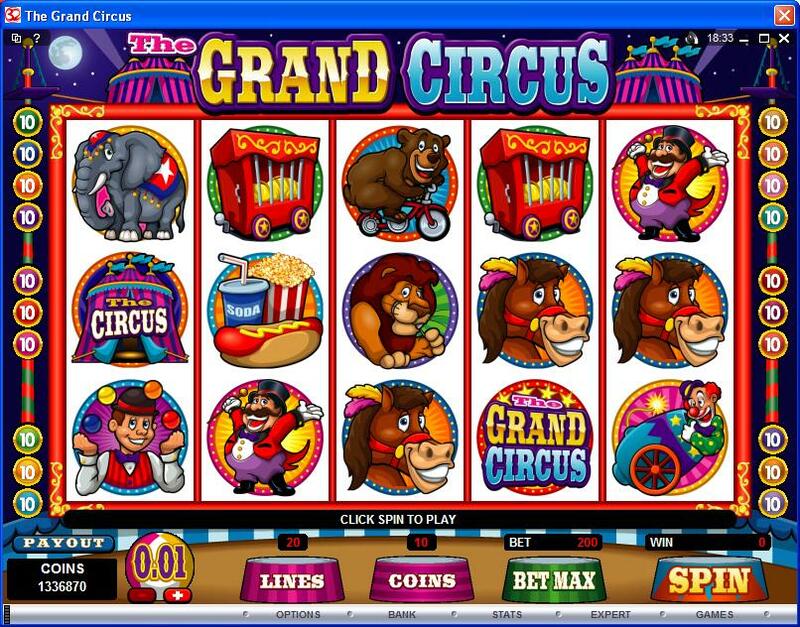 Symbols: Game Logo (wild, 1,000x), The Circus (scatter, 100x bet), Ringmaster (1,000x), Clown in canon (300x), Elephant (200x), Bear on bike (200x), Lion (150x), Donkey (120x), Juggler (120x), Clown Car (120x), Cage (100x) and Refreshments (100x). I’m not the biggest fan of this slot machine, especially because the features are not as well thought out as the design is. 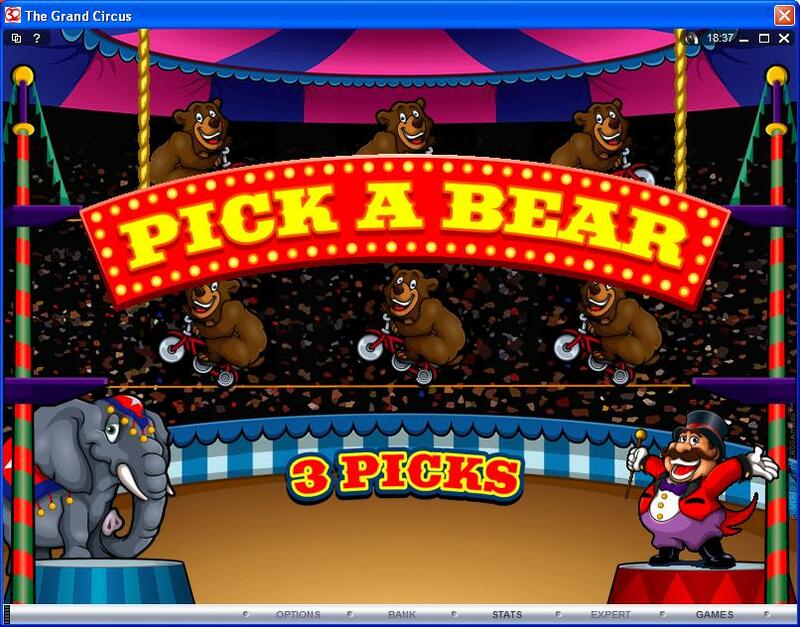 If you enjoy going to the circus, the game might be a good choice anyway. 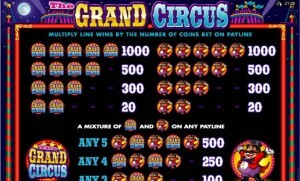 The The Grand Circus slot machine is offered through the Microgaming platform, so if you want to play it for real or just to practice, look out for casinos that use it.